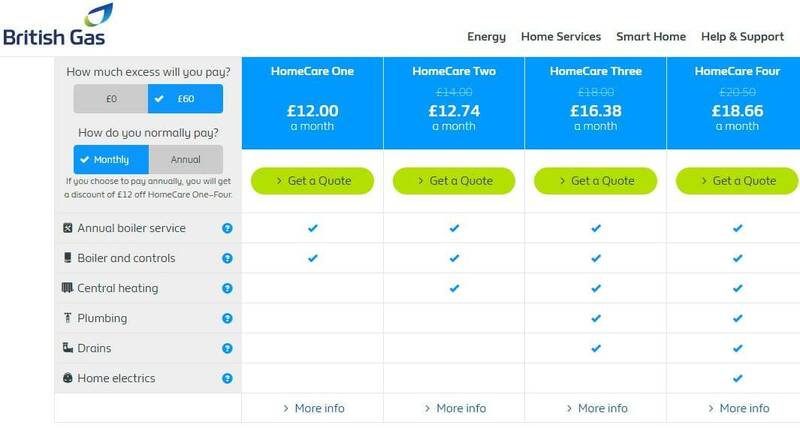 British Gas Homecare Review: Is It Worth The Price? Boiler repairs aren’t cheap. 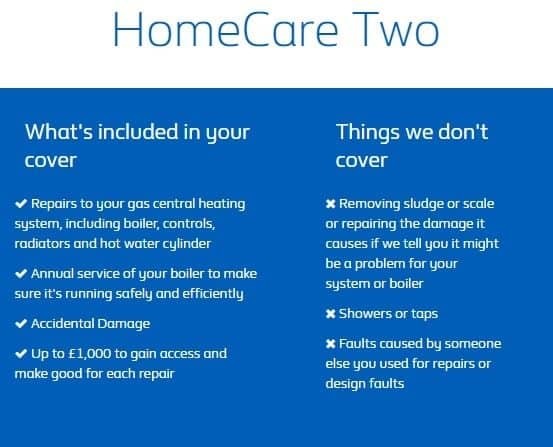 Boiler cover like British Gas Homecare allows you to pay a fixed monthly fee, covering you for breakdowns and repairs. And, depending which package you choose, you could be covered for heating and plumbing issues too. Below we’ll cover everything from prices to online reviews. To start, let’s determine which type of boiler cover you need by explaining the core differences between Homecare products. All British Gas Home products include a free annual boiler service. Typically, you’d expect to pay anywhere from £70-120 depending on where in the country you are, and how expensive your service engineer is. Alongside the service, ALL packages include boiler and controls cover. So, if your boiler or thermostat breaks, that’s going to be fixed for free. It’s worth noting that Homecare One (100) is the most basic package and DOESN’T have central heating cover. This is particularly important if your heating system uses a cylinder. Our opinion? If you’re going to bother with boiler cover, you might as well go for Homecare Two (200) as a minimum. 247 & unlimited call outs. Notice below, we’ve selected zero excess and a monthly payment. Choosing the excess of £60 and paying for cover annually, will reduce the cost. So, let’s assume we’re removing the need for Homecare Three and Homecare Four, due to extras and additional expense. We’ll also ditch Homecare One as it doesn’t include heating cover. That leaves us with Homecare Two; this is the most cost effective cover available, in our opinion. We WOULD use the excess. It’s incredibly small (£60) and makes a huge difference to the overall cost. 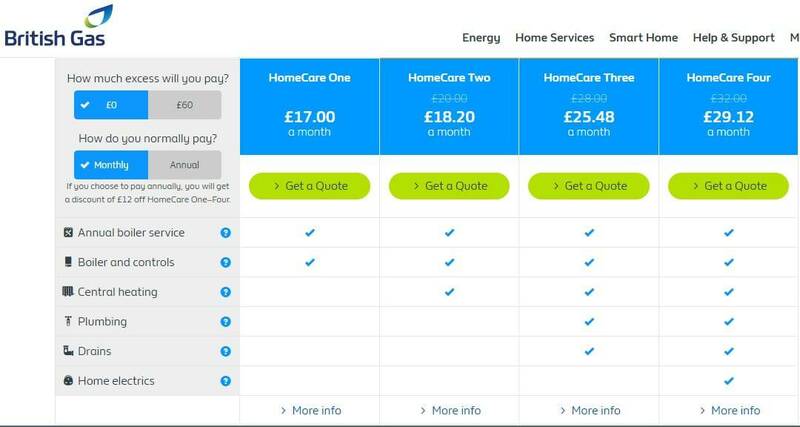 You’ll see Homecare Two has dropped from £17 per month, to under £13. That drops the overall price from £240 when paid monthly, to under £153 over the course of a year. And just to confirm, you’ll not just have boiler cover and a free annual service, you’ll have heating cover too. This isn’t a question easily answered. Not least, since you don’t know when your boiler will break, or how much it will cost to fix. 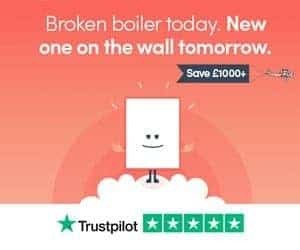 Take a minute to review our cost guide to boiler repair, and you’ll get an idea of how much fixing your boiler might be. All you can do is guess how often you’d repair your boiler, and the rough repair price. In my eyes, the biggest value here, is the piece of mind that boiler cover can give. If a big boiler repair bill is likely to send you over the edge, it makes sense to budget for that monthly, and let British Gas foot the bill when your appliance eventually decides not to play ball. The thing you should be considering here, is whether it makes sense to just save for a new boiler (admittedly, heating cover is including too). Companies like BOXT supply and fit brand new Worcester boilers (which come with a 10-year warranty), for around £2,000. On finance, that converts to around £12 per month. Whilst I’m not 100% against British Gas Homecare, I’d sooner fit a brand new boiler with a 10-year warranty, rather than paying for boiler cover at the same price. Of course, heating cover is included, but issues here are likely to be minimal. Unless you have a cylinder, the only thing to go wrong, is pipework; leaks here are easy and cheap to fix. I’ve heard of instances where boiler cover providers blame damage on sludge (which is basically rust in heating water), and scale (limescale, just like in your dishwasher). One way to avoid problems is to have your system flushed. Not necessarily an expensive power flush, as this can put unwanted pressure on parts and copper joints, but a hot flush. That can remove lots of sludge and limescale from your system. Your heating engineer will then add central heating inhibitor to break down any future limescale and sludge. Finally, they’ll fit a magnetic system filter and limescale filter. Whether you’re planning on purchasing Homecare or not, I’d suggest getting your system flushed out. Sludge in particular can block radiators, or even worse, get lodged in expensive boiler components causing lots of damage. If you’re like me, you’ll check out some reviews before you buy anything. Bear in mind most the reviews are of British Gas as a company, not Homecare specifically. You’ll want to hit CTRL+F and search “Homecare” to find reviews related to their boiler cover products. Like any insurance product, please read all the terms and conditions. Any damage caused by sludge, won’t be covered. This is mentioned multiple times in their terms and conditions. Chances are, if they suspect sludge and you don’t have a power flush from British Gas, they’re Homecare products won’t cover your system. So, is it worth it? Well…yes and no. If you want piece of mind that you’re not going to have to fork out £300 or more for a boiler repair, then boiler cover is value for money. With heating cover included on Homecare Two and above, it’s ideal for those with not just a boiler, but a cylinder too. £150 or so per year isn’t a bad price, especially considering that includes a boiler service worth around £80. That’s assuming there are no hidden surprises and heating systems are fixed quickly. In terms of outright value for money? I’d take my chances. For a boiler that’s out of warranty, but under 5-years old and only needs minor repair, I’d invest the cash to get it fixed. You can see expected costs for boiler repair here. If I had a boiler that wasn’t A-rated (i.e. it’s inefficient and wasting energy), over 5-years old, out of warranty and is becoming unreliable, I’d be considering a replacement. Depending on the size of a property, installation costs can range from as little as £1,800, through to £3,000, but finance is usually on offer from around £12 per month upwards. You can read our guide to boiler replacement here. And, you can get a fixed price on-screen (no call backs or any of that rubbish), using this online boiler price calculator. Thanks for reading our review of British Gas Homecare. Got questions, a review, experience with British Gas boiler cover, or cover from another company? We’d love to hear from you. Drop a comment below, or use our contact form.